Proper lawn leveling needs the right tool. Preparing to plant St. Augustinegrass plugs, my first thought was to buy a “landscaper rake.” But after checking the price and realizing I would use it only once, I made an improvement over the hardware store model. This was free. The reason for this device is that the standard garden rake is too narrow for lawn leveling. Instead of spanning the undulating hills and valleys and dragging dirt from high spots to low spots, the garden rake makes its own small undulations and doesn’t shape the big ups and downs. 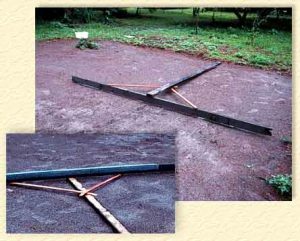 What is needed is at least the dimensions of a “landscaper rake,” with a head 4 feet to 5 feet wide (1.2 m to 1.5 m) . The store-bought version has tines, is often made of aluminum, and is costly. Even so, the tines just scratch the surface and don’t move much soil. For a head I took piece of 4″ x 1″ white wood about 10 feet long, debris left over from a roofing project. I shaped one end by cracking it over my knee. For a handle I grabbed another piece of 4 x 1, complete with splinters, and nailed it to the head to make a “T.” Tandem side tension arms, 2 x 1, were nailed at a 30-degree angle to head. With a little care, pulling this loosely nailed contraption found the high areas, and dragged them short distances into the low areas. The use of the Fake Rake assumes that the planned turf area is basically free of vegetative debris, and that the surface soil is loose. Once the turf area was shaped and leveled, at night I went out with a flashlight held horizontally close to the ground, and rotated the flashlight around in different directions to locate (and flag) the humps and valleys for touch up work the next day. In the end, the Fake Rake can be recycled in the fireplace.